are you new to ET contact? What is it like to work inside the NSA? … here is the story of Karen Melton Stewart – gas-lighted, gang-stalked and targeted by an illiterate psychopath inside the NSA — a female infiltrator creating sexual control files on employees inside the NSA. March 14, 2019 – I listened to Dr. Katherine Horton interview Catherine Austin Fitts and heard about Karen Stewart for the first time. (Solari Report.com). Dr. Horton refers to the hiring of psychopaths and promoting these people into management positions as “deep capture”. In the first Youtube on the list above, Columbia, Maryland, USA is an NSA ghetto? Karen Stewart, worked for the National Security Agency as an intelligence analyst and linguist from 1982-2010, when she was railroaded out of a job just two years before she could have retired for daring to report wrong-doing to the NSA IG, George Ellard. ​She was gang-stalked by NSA Security for three years. She sued the NSA and was targeted again with Infragard stalkers in early 2015 and then later in 2015 with Directed Energy Weapons after publicly stating truthfully in her experience, that 9/11 had been entirely preventable. She therefore has proof that NSA is a big part of the covert Federal government’s stalking harassment and assassination program rolled out by DHS & FBI Fusion Centers and their Infragard dupes and proxies. Okanagan Center for the Study of Extra-terrestrial Intelligence, is a supporter of the CSETI and Sirius communities following the work of Dr. Steven Greer. 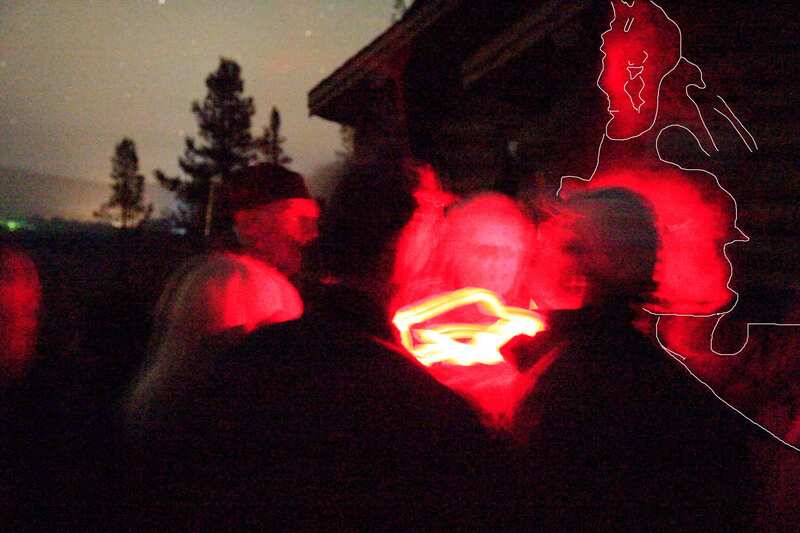 The photos below are from CSETI trainings located at Mt. Shasta, CA and Joshua Tree National Park, CA … I have manually outlined the image of a 12 foot Arcturan that appeared trans-dimensionally during a CSETI training. The being was illuminated by light from the Tri-field meters being held by people in the middle of the circle. Click on the links to reports for more details. My camera is Canon 5D Mark II, the highest ISO was chosen, shutter was open (for 4-30 seconds?). I was standing on a chair, looking down on the people when I took the photograph. I was attempting to send a message telepathically, asking the beings and craft to appear in my images. Close Encounters of the Fifth Kind (CE 5) are available to everyone. If you want a social media siteto locate other people in your area, I recommend the following site from Dr. Greer’s Sirius Disclosure site. I have gotten about 50 email addresses for two provinces in Canada and have contacted these people to organize my annual ET Contact tour. Join now and check the community map to see if there is someone near you whowants to contact ETs as well. FYI … I [DEB WARREN] am standing on a chair taking the photo, EMERY SMITH has his back to the camera, Dr. GREER is to the right with a baseball cap. Everyone is moving the Tri-field meter around so that is the bright light in the middle.